When we can’t manage anger, it can overwhelm us. How we react is influenced by our innate temperament and early family environment. Thus, different people react differently. Codependents don’t know how to handle their anger. Some explode, criticize, blame, or say hurtful things they later regret. Others hold it in and say nothing in. They please or withdraw to avoid conflict, but stockpile resentments. Yet anger always finds a way. Codependency can lead to being passive-aggressive, where anger comes out indirectly with sarcasm, grumpiness, irritability, silence, or through behavior, such as cold looks, slamming doors, forgetting, withholding, being late, even cheating. 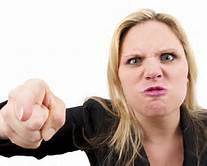 Understanding our reaction to anger includes discovering our beliefs and attitudes about it and what have influenced their formation. Next, we should examine and identify what triggers our anger. If we frequently over-react and view others’ actions as hurtful, it’s a sign of shaky self-worth. When we raise our self-esteem and heal internalized shame, we won’t over-react, but are able to respond to anger in a productive and assertive manner. To learn assertiveness skills, read the examples in How to Speak Your Mind: Become Assertive and Set Limits, and write out scripts and practice the role plays in How to Be Assertive.